This is soooo good, even if I do say so! Then cook on low for another 20-30 minutes. The flavors blend during this slow cooking. 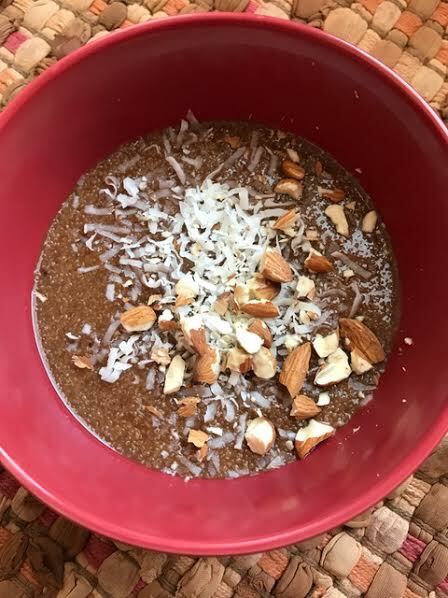 Spoon into bowls, sprinkle with unsweetened coconut (available at WalMart now!) and slivered almonds. Then let it cool until it is barely warm and serve. As this cereal cools, the flavors come alive! It is simply sweet with a hint of chocolate. It is filling and nutritious and a great way to add whole grains to your diet. To make it faster to cook and to break it down a little, soak the amaranth in the water overnight and then start it cooking in the morning. No need to drain the water, just let it soak in the pan on the stovetop and in the morning turn it on to cook. Grains are wonderful to cook ahead and store in the refrigerator too. You can just reheat in a small saucepan and have a very quick breakfast. Actually, this morning I didn’t bother to reheat this amaranth, and it was still yummy!